Amazon Japan has launched the ‘cartoon’ model Kindle Paperwhite, which offers a performance boost over current Paperwhite as well as 8 times more storage, at 32GB. The extra storage is meant to help the device hold hundreds of manga books at once. Amazon has added a few other new features to make it easier for comic-lovers to enjoy the books, including ‘rapid page turn’ which is 33 % faster than the page-turning effect on the regular Kindles, and a two-page spread layout for viewing pages side-by-side. Manga are basically Japanese comics which are often compiled in black and white trade paperbacks. Since there is already a tradition of reading these comics without full color, they are a good fit for devices like a Kindle eReader with a grayscale screen. 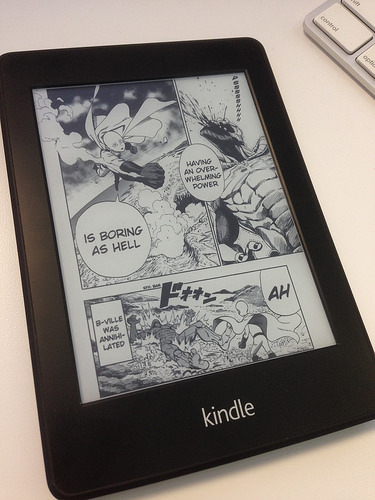 The manga model Kindle Paperwhite also has the same 300ppi display of the newest, regular Paperwhite, and it’d get up to six weeks of reading time between charges. The Kindle Paperwhite that is available worldwide and can received Free Edu Alert has 4GB of storage, which is more than enough for the holding books for the average reader. But for the graphic-heavy titles, more storage is essential. Other than the additional storage space, this Kindle Paperwhite manga model is pretty much same as its cheaper sibling. Both have a 6 inch, 300 ppi touch displays, 4 LED lights for the illuminating the screen, and batteries that should be good for several weeks of use if you read about 30 minutes a day. The manga Kindle is available for pre-order now, along with pricing commanding a slight premium over the usual Paperwhite. You are spending ¥16,280 (about $157), or ¥12,280 ($118) if you’re an Amazon Prime subscriber. The first units ship Oct 21st, and the update to improve page turning performance should arrive by the end of the month. As you might gather, it isn’t very likely that you’ll see this model elsewhere in the world — when the 4GB in regular Kindles is enough to hold thousands of regular books, Amazon does not have much incentive to boost their capacity any time soon.